We had our company outing last Saturday. I ought to stay at Tita 9's place the day before that. The hired bus for the Zambales trip was scheduled to leave at exactly 6am the next day in Makati and good luck if I could woke up at 5am if ever I slept at home instead! Hirap pa makakuha ng taxi sa amin ng ganung oras. So ayun, umuwi lang ako so I could pack my things and by around 11pm I was already at their condo. Full house. I spent the night online since I have no plans of sleeping anymore. However, after several websites and chat windows opened, I gave in to the call of Mister Sandman. To nyunyu-land we go! Buti na lang nagising ako sa alarm clock ni Bakex several hours after. Karipas ako papuntang Makati na may bitbit na isang supot ng shawarma. Hola, hininga! Arriba! Kala ko late na ko para bumili ng anik anik but I saw Menchie getting off the bus so sumama na muna ko maghakot ng chichirya. As scheduled, the bus took off by 6am. I just goofed around the bus for a while but hit it off to nyunyu-land once again after we entered NLEX. Bawi tulog! Sabi ko ke Koya Dens bigyan ko sya hundred bucks, iboto nya ko sa Senado. The next time I knew, we were already past Subic Freeport. Antagal ko pala nakatulog. Sulit. Una kong sinigaw pagkagising, "HARUTAN NA!!!". Recharged na ko e. Haha. Goof offs gallore until we reached the place. It's quite remote since it's still 12km away the city of Iba. Oo nga pala, nakarating na ko sa place na ito two years ago. 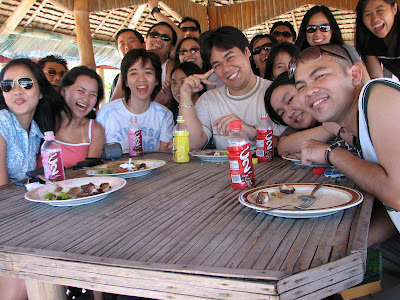 I was looking at the blog entry I did for that trip and damn... kung payat nako ngayon, mas payat pa pala ako noon! Haha. Check it, check it! Na-miss ko bigla yung mga gala ng Justice League. Rama Beach Resort was at Botolan, Zambales. The beach front is a part of the wavy South China Sea so even at a climate as dry as this month, the waves were characteristically strong. Room assignments were given out upon entry to the resort. As usual, pinagsama-sama kaming mga sira-ulo sa isang kwarto. At least two of the other guys transferred to our room to join the fray - sans regards to the already irate organizers. Pasaway! It was already high noon and nobody was interested to get crispy so we just took our lunch, had some photo ops, tas tumambay gallore! The place din't change much from the last time I was there. As usual, bawal pa rin basahin (o hawakan man lang!) yung Starwars book nung Australian na may-ari na trip na trip ko dahil hard-to-find na siya! Bugger. Nag bilyar na lang kami tas poker tas tulog tas harutan. Around 3:30pm-ish na nung sumugod kami sa dagat. The girls were still hanging out on a nearby gazebo. Takot pa sila sa araw. We all jammed in the ocean until a couple of minutes after sunset. Ang ganda! After dinner, we just hang out around the complex. Yung mga ka-kwarto ko nagsipag inuman... Absolut Kurantz at Empi ang nakasalang (pati usapang sabong!). My plan was to jam with them kaso na-wili kami ni Ranger Roy sa sugalan with the gerls and the couples! Awk! Besides, medyo iwas ako sa hard kasi hindi ako tumatagal ng nasa sariling katinuan. Buti na lang meron din kaming beer sa gazebo. We just played "In Between" until past midnight. Umabot na ng lampas isandaan yung pot money during the first round and everyone was still conservative with their bets. Nagkalakasan lang ng loob nung medyo tinatamaan na lahat ng antok. The last rounds din't even last half an hour, ubos na agad yung starting bets! Hindi ko pala naikwento... somewhere dyan nagkaron ng bon fire session at some company-related talks and awardings. O - B - I... sige bilad! Kinaumagahan, ganun pa din kasikat ang araw kaya ilan lang nag tiyaga bumalik ng dagat. Some just contented themselves with the pool. Tambay lang ulit kami at photo ops. Relaks, relaks lang until lunch was served. Panalo talaga sights sa Rama! Kahit nung punta namin last 2005, gloomy pero napaka scenic ng lugar. Wala pa masyado tao! Chillax talaga. Sana andun si Batgurl. Pwede naman magsama ng kahit sino and some of my mates even brought their kids kaya nakakatuwa. Kaso asa pa. Alangan kasi yung araw. Malayo ang tingin. Wala namang tinitignan. We left the place at 1pm and arrived in Makati by some minutes past 4:30pm. All the time I was with them, I was jotting down notes on a small piece of paper. We'll be spearheading an official company newsletter soon and I was assigned to cover this outing for a narrative article. I'll be drafting the details tomorrow. In addition, I was all delegated some works on the layout and a review of the current music trends... I like! Hehe. Pagkauwi, nadaan ako sa plaza and Captain de Vera and his alipores were playing basketball. 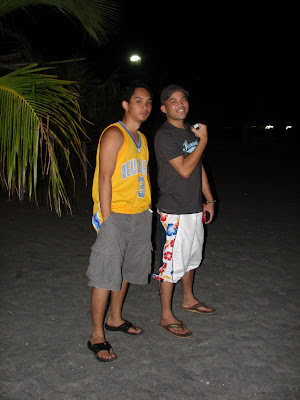 Naharang ako, and the basketball adik that I am din't have to think twice. Tumakbo lang ako pauwi, kumaway sa bahay, humalik sa mahal kong couch, at nagbihis na ng panlaro para kumaripas pabalik ng basketball court. May mga dayo kaming nakalaban and actually won a container of Coke. Kamusta naman pag uwi. Pagod. Buti na lang andun yung kambal. Nakipag kulitan lang ako saglit bago humiga sa trono kong couch. Ahuhuy! Obi's Papanchin List (Take 5) <-- oo, link ito. ano ga, hudas? tayo naman lumabas at maghasik ng kagwapuhan! hey, obi! i like what you did with the sand. how'd you make your name like that? jaiskizz: men nahihiya na nga ko sa yo e. wala talaga mapag ipitan ng oras. makakabawi din ako sayo! ace: yep yep! noticed how everyone etches their name on the sands for a photo ops. ako naman, i just did a beveled out version. just like making a sandcastle but spelling your name instead. cool no. 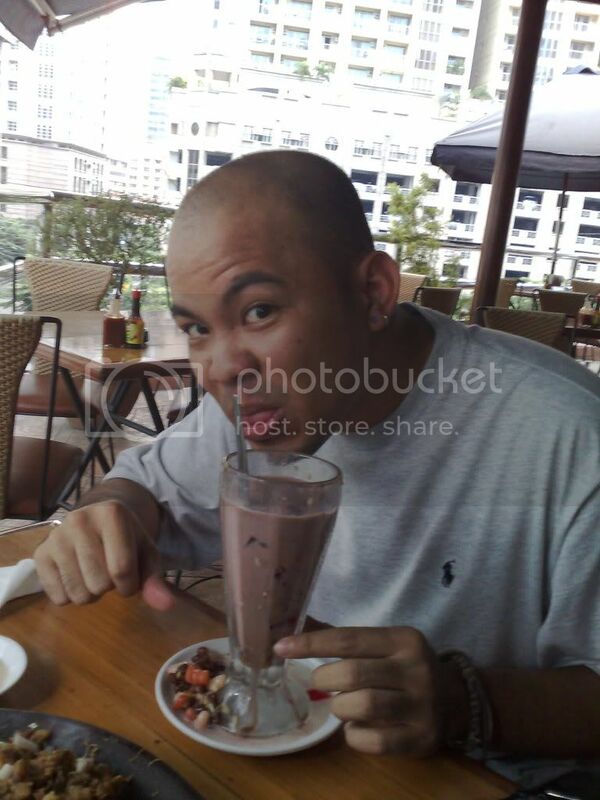 ralphtee: sarap men. summer the best.